← What Women Want – Treat Her Like a Horse! The shopping started well mainly due to the fact that A) I was busy doing non shopping activities B) I am broke and C) the ATMs all ran out of money. I’d managed to only spend ten euro in Horseware which is a miracle in itself and I was so almost back to the car park when it happened. There it was in its lovelieness on a mannequin. It looked stylish, it looked more expensive than it was. It exuded ‘I’m an expensive classy lady really’. I decided to try it on in the hope that it would look awful and I wouldn’t want it, a technique that works quite often. ‘ah feck’ my friend said ‘I want to tell you it’s horrible but it isn’t’. Dammit. Job done and there it was in the bag. What was it? A jacket. Of course it was a jacket it’s always a fecking jacket they are my kryptonite! (them and anything made out of brown leather, furry half pads and anything wine, navy or brown). I’m not even seduced by fancy jackets to wear at competitions it’s the casual ones that get me. Of course it’s been designated as a ‘good’ jacket only to be worn at shows or when trying to look professional when teaching or grooming. That will be its role until it eventually gets worn down the yard for more than five minutes and ends up covered in hair, slobber and hay. The worst thing is I can’t even find an excuse to justify this purchase beyond the point that it was hobbit sized and therefore doesn’t make me look four feet tall. 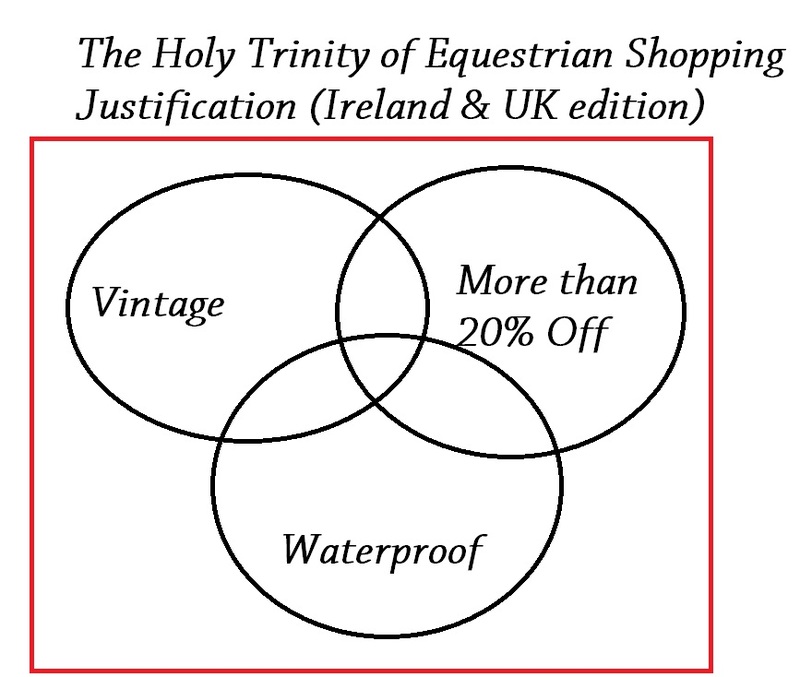 It does not even meet one of the holy trinity of criteria for equestrian shopping justification. On the plus side I also found an extremely cheap raincoat that fits firmly into the holy trinity as do the jod boots I bought for €20 when I had budgeted €60. So………technically I saved money? Posted on August 12, 2013, in General and tagged 2013, Dublin Horse Show, equestr, equestrian, equestrian shopping, horses, horseware, ireland, irish equestrian, irish equestrianism, irish humour, jacket, jodhpur boots, RDS, rds dublin, RDS Dublin Horse Show, sales, shopping, vintage, waterproof. Bookmark the permalink. 3 Comments. Love it L, shall have to try to apply your Holy Trinity to my own equine shopping – god knows I don’t do any other kind of shopping anymore! Must catch up on your other blog posts now, was away on hols for 12 days and am soooooooooooooo far behind on my blog reading that I am afraid to go near my own blog to see how much catching up there is to be done – Yikes!